Home / GST-Tally / TallyERP.9 Lessons / How to Update GSTIN Details for Party? How to Update GSTIN Details for Party? Before rolling out GST, all dealers/ manufacturers/ retailers update their systems with GSTIN. But did you know how to update GSTIN Details in Tally. 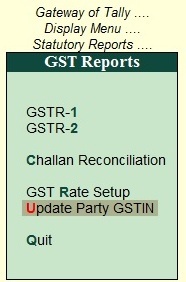 For quickly update GSTIN in Tally for your parties group wise from the Update Party GSTIN Report go to Gateway of Tally - Display - Statutory Reports - GST - Update Party GSTIN. Select the Group and Ledger for which you want to update GSTIN Number. Select Single ledger for update a single party GSTIN or Select All Items (under Name of Ledger) to update All GSTIN Number combine for a single group. Second Option is Import Party GSTIN through Excel File. Import Party GSTIN can be done only from Add-on provided by Tally (Click here to download ADD-On). If you want to update your all parties GSTIN details together with only one click then it is very useful tool. After download the Addon Extract this on any place and copy the file name ImportGSTIN.tcp and paste it in your TallyERP9 Installation Folder. Now open Tally and Press F12: Configuration - Product & Features - F4 - Manage Local TDL (or you can direct click on release no. mention at bottom of your tally screen and press F4). First you have to export above GSTIN Update Party format in Excel (File contains only those records who doesn't have GSTIN). Export file will be open on your computer screen with required fields. Enter all the details related to Party (Country, State, Registration Type & GSTIN) and save. Now Go to Gateway of Tally - Display - Statutory Reports - GST - Import Party GSTIN. Enter the path of your Tally Installation folder with excel file name (Remember do not change sheet name otherwise Tally will not import your any record). Press Enter to Accept. When the import complete successfully display the message " Import done Successfully" otherwise shows error and open the error file to rectify the mistakes in Data. Now If you want to update your own company / firm GSTIN then first you have to migrate your data in Tally ERP9 Release 6.0.1 and rewrite the data (If you have a license version or previously running data in release 5.0 or above then tally migrate your data without rewrite or any migration tool). After migrating data you can see the following message on your screen. It is for Enter your own company GST Details in your Records. Press Enter to mention your Company GSTIN Details or Esc for enter it later.